Gold fell to as low as $1661.40 by about 9AM EST before it bounced back higher midday, but it still ended with a loss of 0.71%.Silver slipped to $31.874 before it also rebounded, but it still ended with a loss of 0.93%. Gold and silver equities fell about 2% at the open and remained near that level for the rest of the day. There were no major economic reports today.Tonight at 9PM EST is the State of the Union speech.Tomorrow at 10AM EST brings Pending Home Sales for December expected at -3.0% and at 12:30 is a FOMC Rate Decision. Oil fell as the U.S. dollar index rose on renewed worries about the ability to come up with a debt deal for Greece. The Dow, Nasdaq, and S&P traded mostly slightly lower on worries about Europe and tomorrow’s fed meeting. Among the big names making news in the market today were Verizon, Morgan Stanley, J&J, McDonald’s, and DuPont. “Barrick Gold was downgraded this morning to sector perform by some of the "analysts" citing concerns over delays and cost escalations at new mines under construction. 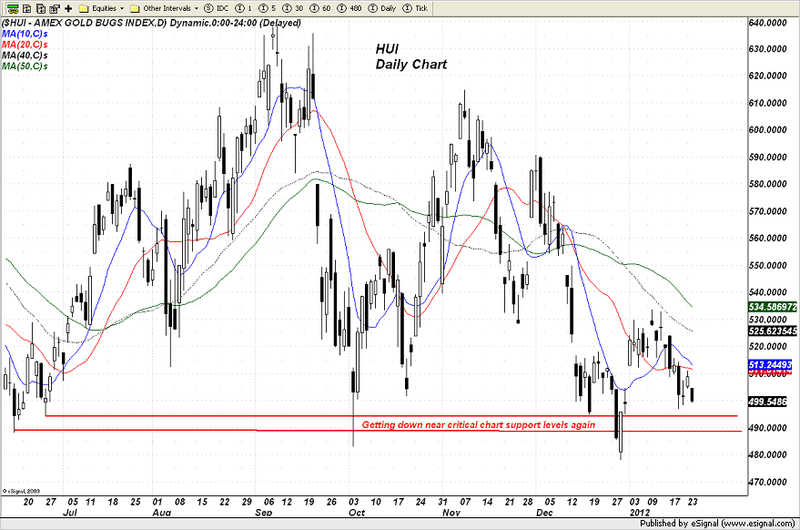 Tie that in with weakness in both gold and silver, which ran into long liquidation and some fresh selling after failing to better the chart resistance levels noted yesterday, and that has resulted in the HUI sinking down to the bottom of a critical support level on the price chart once again. The gold shares in general are becoming dogs that cannot hunt or in the case of some, not even bark. The same hedge funds that have been buying them down at this level late last year and early this year had better not have a change of heart. Still, it is only Tuesday so they do have time to recover before the end of the week. They will certainly need to or we are going to see a technical chart breakdown. Pressure in gold and silver today is coming from a slightly stronger Dollar and some increased chatter over Greece and woes associated with that running sore. Traders are a bit hesitant to get too aggressive on the risk trades as a result and are exercising a bit of caution. That is allowing for some long liquidation and fresh short sellers from top pickers. Silver stills need to get a solid close ABOVE $32.50 to avoid sagging here while gold needs to close over $1680 to avoid a setback towards $1650. Bonds, a good measurement of the willingness of traders to take on risk, are basically flat today reflecting the lack of conviction either way for today's session. We'll see what we get in tomorrow's session which should be more telling as to where we might head next. Note: Change in Total Tonnes from yesterday’s data: SPDR subtracted 5.139 tonnes. COMEX Gold Trust (IAU) Total Tonnes in Trust: 174.03: No change from yesterday’s data. Silver Trust (SLV) Total Tonnes in Trust: 9,516.75: No change from yesterday’s data. Banro’s (BAA) Updated Economic Assessment, Randgold’s (GOLD) gold production, Gold Fields’ (GFI) possible JV, Endeavour Silver’s (EXK) review of the Company's exploration results in 2011 and its exploration plans for 2012, and First Majestic’s (AG) mill expansion and construction update were among big stories in the gold and silver mining industry making headlines today. Disclosure:The owner, editor, writer and publisher and their associates are not responsible for errors or omissions.The author of this report is not a registered financial advisor.Readers should not view this material as offering investment related advice. Gold-Seeker.com has taken precautions to ensure accuracy of information provided. Information collected and presented are from what is perceived as reliable sources, but since the information source(s) are beyond Gold-Seeker.com’s control, no representation or guarantee is made that it is complete or accurate.The reader accepts information on the condition that errors or omissions shall not be made the basis for any claim, demand or cause for action.Past results are not necessarily indicative of future results.Any statements non-factual in nature constitute only current opinions, which are subject to change.Nothing contained herein constitutes a representation by the publisher, nor a solicitation for the purchase or sale of securities & therefore information, nor opinions expressed, shall be construed as a solicitation to buy or sell any stock, futures or options contract mentioned herein.Investors are advised to obtain the advice of a qualified financial & investment advisor before entering any financial transaction.